From the fringes of space and time comes the dreaded Galactus, prepared to feast on the Ultimate Universe! 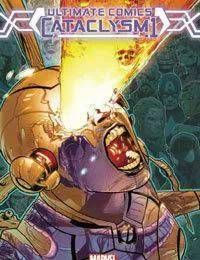 With an entire universe full of new planets to devour, it's up to the Ultimates to stop him from the catastrophic destruction of their entire universe!<br />Plus, don't miss the return of fan-favorite Ultimate Vision as she makes a desperate, last-ditch attempt to stop Galactus and the Gah Lak Tus swarm! But is she enough to stop the coming of the dreaded Devourer of Worlds? Witness the beginning of the end in Cataclysm 0.1!